JACKSON, Minn. - June 24, 2016 - 2013 World of Outlaws Craftsman® Sprint Car Series champion, Daryn Pittman, started on the pole position and captured the lead from Joey Saldana on lap two, then held off a hard-charging Kerry Madsen on a green-white-checkered finish to score his fifth victory of the season at Jackson Motorplex on Friday night. "I wouldn't say winning twice makes you good at a place," Pittman said. "They don't call him "Mad Man" for nothing. He's earned his nickname and you know he is going to give it everything he's got to try and get by you. "I felt like I had a pretty good green flag lap up until coming back for the white. I slipped up a little bit in one and two and I thought I could hear him on my outside exiting two - I don't know if he was there or not, but it sounded like he was pretty close." Pittman looked to be cruising to an easy victory until a caution with just two laps remaining brought Madsen, in the Keneric Healthcare/American Racing Wheels No. 29, to the leader's rear bumper. Madsen tried everything he could to wrestle the victory from Pittman in a green-white-checkered finish, but settled for a second-place finish following a last lap duel. "I had such a good restart on that final one," Madsen said. "I knew I had one shot so I ripped it in there wide open, never lifted, and it caught and cut the front on me and I lost a little bit of time. "It just wasn't enough. Everything was going to have to be absolutely perfect to get the job done. But it was a heck of a run - I couldn't have drove any harder, so it was a lot of fun and I enjoyed it." Saldana remained glued to the leader's bumper, but following cautions on lap 10 and 15, Pittman appeared to have an easy control on the top spot. On the final restart, Madsen started just behind Pittman and quickly charged to his outside in turn one. Pittman held strong and kept his car out front, but he had one more lap to hold off the "Mad Man." 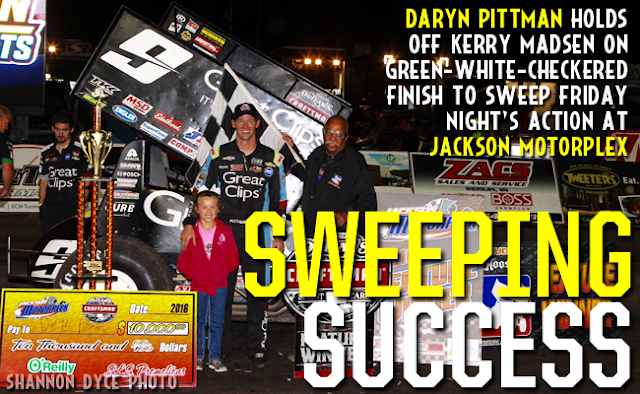 "I know [Kerry] Madsen and [David] Gravel were throwing everything they had at us tonight," Pittman added. "Hats off to this whole Great Clips crew, they have been working their tails off. I felt like we have been in a slump this last month - we have been fast but have had things happen... but it's a long season and I'm glad we could get a win. "It feels like it's been a long time since we have been here. Our car is fast and I am looking forward to tomorrow, [Beaver Dam Raceway] is one of my favorite tracks on the schedule and I have a pretty good record there, and really looking forward to that one." "I was thinking if I could stay up there and keep my tires warm, we would be golden when we got to traffic, but it didn't quite happen," Madsen said. "That's just racing and I am just glad we went fast." "I'm pleased [with how things are going]," Stewart said. "I'm just really shocked we ran third tonight, to be honest. We really didn't have a third-place car, but we just had a really restart that one time and that saved us. "My guys continue to work hard and we're okay. We keep winning races and we have some big races coming up, and hopefully we can win some of those too. I have to thank Justin [Marks] and Kyle [Larson] for the great opportunity, and all of our great sponsors that help us, and all of the great fans that came out tonight." The World of Outlaws Craftsman Sprint Car Series will voyage over 350 miles east overnight to Beaver Dam, Wis. for the Jim "JB" Boyd Memorial presented by Karavan Trailers at Beaver Dam Raceway on Saturday night. For more race information and ticket purchasing options, visit: www.WoOSprint.com/Beaver-Dam-Raceway. RACE NOTES: Daryn Pittman scored his fifth win of the season and first since New Egypt on May 24...Pittman has now started on the pole position in 9 races this season, five more than any other driver...Kerry Madsen picked up his second KSE Hard Charger Award of the season after picking up 10 spots to finish second. CONTINGENCY WINNERS - MSD Ignitions ($25 cash): Sammy Swindell; MSD Ignitions ($50 cash): Daryn Pittman; Penske Shocks ($50 cash): Donny Schatz; JE Pistons ($50 cash): Jason Johnson; VP Racing Fuels ($50 cash): Jason Johnson; Edelbrock ($50 cash): Tim Kaeding; Comp Cams ($50 cash): Paul McMahan; Morton Buildings ($50 cash): Jason Sides; Cometic Gasket ($50 cash): Joey Saldana; Super Flow ($50 cash): Logan Schuchart; Craftsman/Sears ($100 cash): Ian Madsen; KSE Racing Products ($100 product certificate): Kerry Madsen; Comp Cams ($50 product certificate): Daryn Pittman; JE Pistons (Set of Rings): Terry McCarl; JE Pistons (Set of Rings): Logan Schuchart. SEASON WINNERS: Donny Schatz - 10 (Volusia Speedway Park on Feb. 14, The Dirt Track at Las Vegas on March 4, Stockton Dirt Track on March 18, Stockton Dirt Track on March 19, Silver Dollar Speedway on April 2, Lincoln Speedway on May 19, Weedsport Speedway on May 22, Lincoln Park Speedway on June 8, Knoxville Raceway on June 11, River Cities Speedway on June 17); Brad Sweet - 6(Volusia Speedway Park on Feb. 13, Volusia Speedway Park on Feb. 14, Cotton Bowl Speedway on Feb. 26, Ocean Speedway on April 1, Bakersfield Speedway on April 15, Plymouth Speedway on May 13); Daryn Pittman - 5 (Royal Purple Raceway on Feb. 27, Perris Auto Speedway on April 16, USA Raceway on April 18, New Egypt Speedway on May 24, Jackson Motorplex on June 24); Shane Stewart - 5(Arizona Speedway on March 6, Devil's Bowl Speedway on April 23, Lawrenceburg Speedway on May 30, Granite City Speedway on June 15, Brown County Speedway on June 19); Joey Saldana - 4 (The Dirt Track at Las Vegas on March 3, Devil's Bowl Speedway on April 22, Jacksonville Speedway on May 4, I-80 Speedway on June 22);David Gravel - 3(Thunderbowl Raceway on March 12, Tri-State Speedway on May 14, I-96 Speedway on June 6); Kerry Madsen - 2(Eldora Speedway on May 6 and 7); Lance Dewease - 1(Williams Grove Speedway on May 20); Chad Kemenah - 1(Fremont Speedway on June 3); Jason Johnson - 1 (Placerville Speedway on March 24); Terry McCarl - 1 (Knoxville Raceway on June 10);Jason Sides - 1 (I-30 Speedway on April 26); Greg Wilson - 1(The Dirt Track at Charlotte on May 27). Last Chance Showdown - (12 Laps - Top 4 finishers transfer to the A-feature) - 1. 24-Terry McCarl [-]; 2. 55-Brooke Tatnell [-]; 3. 10-Dakota Hendrickson [-]; 4. 56-David Heskin [-]; 5. O9-Matt Juhl [$300]; 6. W20-Greg Wilson [$250]; 7. 2X-Derrick Lusk [$225]; 8. 44-Chris Martin [$200]; 9. 7X-Kaley Gharst [$200]; 10. 16-Travis Whitney [$200]; 11. 1A-Jacob Allen [$200]; 12. 23W-Scott Winters [$200]; 13. 35-Skylar Prochaska [$200]; 14. 7W-Tasker Phillips [$200]; 15. 13-Clyde Knipp [$200]; 16. 17A-Austin McCarl [$200].